Crate and Barrel has something VERY similar. There's a lot going on in that bedroom! Maybe Christopher Spitzmiller Small Gourd in Platinum? Love seeing the whole bed straight on like that. So pretty. I think they're from Pottery Barn - but a handful of years back. I bought the mini version at that time ... and still like them. Oh my goodness Decorno looks like you've lost your groove. What happened to the snarky design maven that we all loved? Totaly agree, dont they look so luxurious! pottery barn. They are from a couple years ago. Circa Lighting has a few that have the same feeling, but not exact matches to the image. Haley table lamp from Crate and Barrel is similar. Currey and Company Barbasdos lamp is different, but soooo pretty. Lots of stunning table lamps on LylaGrace, but you probably know that already. roost makes a pretty mercury glass one. 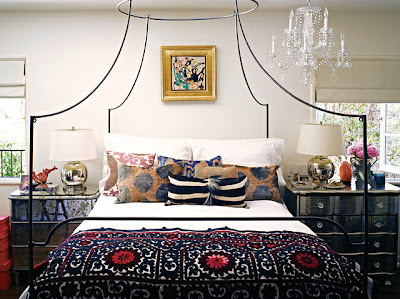 Love the cover on the bed. Any ideas whose it is? I think the lamps are Pottery Barn.